New Lexmark 14N1068 (#100XL) Black, High Yield, Premuim Quality Compatible Ink Cartridges designed to fit the Lexmark Impact S305/ Interpret S405/ Intuition S505/ Interact S605/ Prospect Pro 205/ Prevail Pro 705/ Prestige Pro 805/ Platimum Pro 905 printers. New Lexmark 14N1069 (#100XL) Cyan, High Yield, Premuim Quality Compatible Ink Cartridges designed to fit the Lexmark Impact S305/ Interpret S405/ Intuition S505/ Interact S605/ Prospect Pro 205/ Prevail Pro 705/ Prestige Pro 805/ Platimum Pro 905 printers. New Lexmark 14N1070 (#100XL) Magenta, High Yield, Premuim Quality Compatible Ink Cartridges designed to fit the Lexmark Impact S305/ Interpret S405/ Intuition S505/ Interact S605/ Prospect Pro 205/ Prevail Pro 705/ Prestige Pro 805/ Platimum Pro 905 printers. New Lexmark 14N1071 (#100XL) Yellow, High Yield, Premuim Quality Compatible Ink Cartridges designed to fit the Lexmark Impact S305/ Interpret S405/ Intuition S505/ Interact S605/ Prospect Pro 205/ Prevail Pro 705/ Prestige Pro 805/ Platimum Pro 905 printers. New Lexmark 14N1614 (150XL) Black, Hi-Yield, Compatible Ink Cartridge for the Lexmark S315/ S415/ S515, Pro 715/ 915 printers. 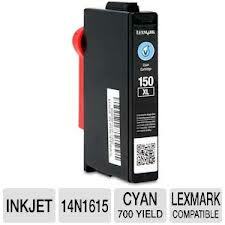 Lexmark 14N1615 (150XL) Cyan, Hi-Yield, Compatible Ink Cartridge for the Lexmark S315/ S415/ S515, Pro 715/ 915 printers.